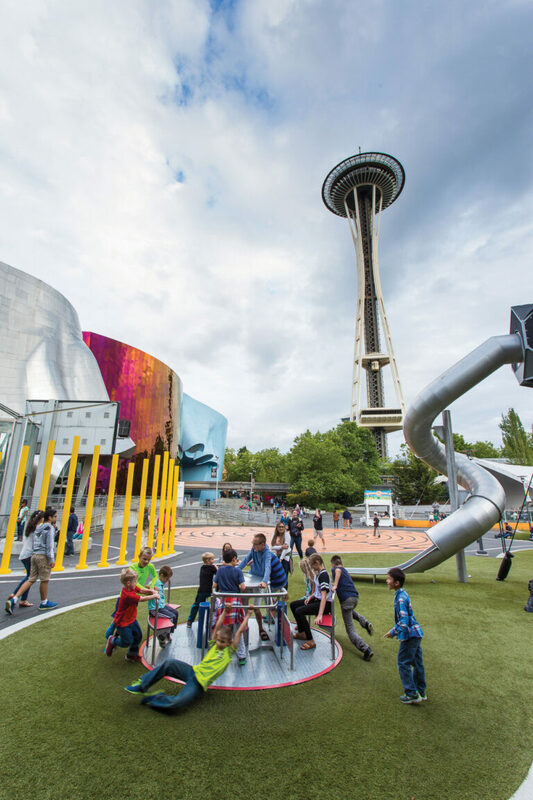 Whether spring has sprung or is just springing a leak, Seattle offers plenty of fun for families. Commune with nature at Discovery Park (3801 Discovery Park Blvd), the largest park in Seattle. With more than seven miles of trails, families can choose their own adventure—through peaceful forests and meadows, up to unrivaled views of Puget Sound and the Olympic Mountains, or down to the beach for tidal explorations. Tucked beside the Museum of Pop Culture (MoPOP) (*325 Fifth Ave N; mopop.org)—where immersive exhibits like the VR-style Holodome and the interactive Sound Lab engage tweens and teens—the Artists at Play (*305 Harrison St; seattlecenter.com) playground is a treasure trove of delights. Kids can conquer the 35-foot climbing tower, careen down a colossal tube slide, navigate a maze painted on the ground, or manipulate the child-inspired musical instruments and listening stations. The view of the city skyline and Elliott Bay alone is worth the ticket price aboard a Washington State Ferries (801 Alaskan Way, Pier 52; wsdot.wa.gov/ferries) vessel to Bainbridge Island. Older kids can appreciate the scenery, while younger ones will be awed by the boat experience. On Bainbridge, multiple family-friendly cafes and restaurants (see page 81) offer the perfect rest and repast for a day trip. Get close to life under the sea at Seattle Aquarium (*1483 Alaskan Way, Pier 59; seattleaquarium.org) on the waterfront. See the little ones go wide-eyed at a giant octopus, moon jellies, and other Pacific Ocean inhabitants, and take in the massive Window on Washington Waters exhibit, where divers answer visitors’ questions from underwater. The Museum of Flight (*9404 E Marginal Way S; museumofflight.org), south of downtown, houses one of the nation’s largest air and space collections. Its impressive display includes the first Boeing 727, 737, and 747 jets; a retired Air Force One; and a full-scale fuselage mockup of the space shuttle orbiter. Kids’ imaginations will take flight in the cockpit of a Blackbird spy plane and hang-gliding simulator. Seattle’s iconic Pike Place Market (*First Ave and Pike St; pikeplacemarket.org) is a feast for the senses, with stalls of fresh produce, flowers, and artisan wares. It’s also the site of the original Starbucks cafe. The market’s allure for families, however, are the salmon-slinging fishmongers, street performers, gum wall, and sweet treats at shops like the vintage-styled Chocolate Market with local fudge. With five buildings of hands-on exhibits that bring science to life, there’s something to pique all interests at Pacific Science Center (*200 Second Ave N; pacificsciencecenter.org). This gem houses a tropical butterfly house, a planetarium, laser shows, and two state-of-the-art IMAX theaters. Also at Seattle Center, Seattle Children’s Museum (305 Harrison St; thechildrensmuseum.org) is the place the kindergarten set burns off energy in Northwest-themed play worlds. To amuse adventurous tweens, head to Seattle Bouldering Project (900 Poplar Pl S; seattleboulderingproject.com) for 50,000 square feet of facilities, including climbing, yoga, and a restaurant and bar. All climbing here is rope-free, and there are diverse routes—everyone from newbies to pros is welcome. Bouldering classes are free with admission, while shoe rentals are free for first-timers.